EP 83: Mo’s one way ticket is to his hometown, to this time, when Richard Mentor Johnson was the US Vice President. 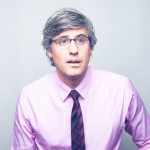 Humorist, journalist and actor Mo Rocca is a correspondent for the Emmy-winning newsmagazine CBS Sunday Morning on the CBS Television Network, the creator and host of Cooking Channel’s Emmy-nominated My Grandmother’s Ravioli, the host of The Henry Ford’s Innovation Nation (part of the “CBS Dream Team, It’s Epic” Saturday morning programming block), and a regular panelist on NPR’s hit news quiz show Wait, Wait…Don’t Tell Me! He spent four seasons as a correspondent for Comedy Central’s The Daily Show with Jon Stewart and four seasons as a correspondent for NBC’s The Tonight Show with Jay Leno. He hosted Food(ography) on Cooking Channel and served as a judge on Food Network’s Iron Chef America. His television credits also include the VH1 retrospective series I Love the 90s, I Love the 80s, and I Love the 70s, Bravo’s Things I Hate About You, and Animal Planet’s Whoa! Sunday with Mo Rocca. He made cameo appearances on the CBS daytime soap opera The Young and the Restless and on Telemundo telenovela Amor Descarado. In addition, Rocca hosted the PBS voting rights documentary Electoral Dysfunction, and wrote the satire book All the Presidents’ Pets: The Story of One Reporter who Refused to Roll Over. Rocca began his career in television as a writer and producer for the Emmy and Peabody Award-winning PBS children’s series Wishbone. He went on to write and produce for other children’s series, including ABC’s Pepper Ann and Nickelodeon’s The Wubbulous World of Dr. Seuss. The former president and author of Harvard University’s Hasty Pudding Show, Rocca’s stage credits include Vice Principal Douglas Panch in the Broadway production of The 25th Annual Putnam County Spelling Bee, and Doody on the Southeast Asian tour of Grease. A native of Washington, DC, Rocca lives in New York City.